The Pro Cable Stripping Knife strips insulation (jacket) off of submarine, video, security, computer, power, and other soft cables. It cuts through the insulation around the circumference with the very sharp blade, and then the front blade cuts the insulation along the length of the cable with the help of metal shoe guide - the sleeve just peels off. There are also six molded notches of varying size for wire stripping. The design lends itself to ambidextrous use. It is not only one of the sharpest knives around but it is also one of the safest. The blade is made of high carbon alloy steel from Japan and is infused with Molybdenum and Vanadium through a proprietary manufacturing process to achieve a level of hardness (HRC 58~60). The blade is precision-ground for long lasting edge. Handle and finger holder are made of Nylon with 30% fiberglass. 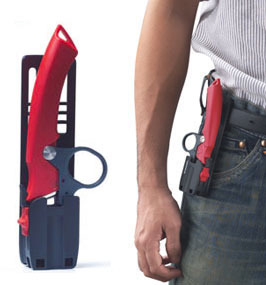 This knife is a choice tool for electricians and cable installers. I was surprised when I got these of the quality. These are really well made. I haven't got a chance to use them yet. I liked how well they were made I bought the other model cruiser with the scissors as well. I have been using a sharp table knife to strip jackets off power cables. This knife makes clean cuts and saves time. I do all electrical work on my boat; this knife works great for stripping jacket off precisely. My neighbors borrowed it and he loved it too. Bit expensive but worth every dollar 'cause it works. I work at a university campus and told my colleagues about this tool. This is awesome. Use them to strip 15 strand video cable; nice and easy. Strip each strand too. Very handy tool. These are good quality strippers and really well made. I was surprised when I got them. I bought a multiple scissors as well. Never thought these would be so useful. I ordered them 'cause they sounded like would work on thick cables but they are outstanding. Easy to use once you get the hang of it. Great buy. Great tool. Super sharp knife; used properly it does a great job. Watch the video on their web site for instructions. Wish the blade was replacable; I fear it will wear out. I got it for my husband who used to struggle with knives which aren't always sharp. He does electrical work at home and helps friends. He is a happy camper. Sharp blades - be careful. Once you get used to it; the depth of cut into the sleeve is just right. Really, the cable sleeve just peels off. T'is a good feeling.